Saturday March 13th 1897 I was at home alone all day. I worked all day on a dress for myself. Will took the butter to town and got things we needed. We read all the evening Sunday March 14th 1897 I wrote a letter to [Fanny?] in the forenoon and read some. Will and I spent the afternoon over at Aunt Lindas. George Jordan came to [work? wash?] tonight. We read in the evening. Weather cold for the time of year. Monday March 15th 1896 I was busy all forenoon with the wash In the afternoon and evening worked on a dress I am fixing. pleasant day. 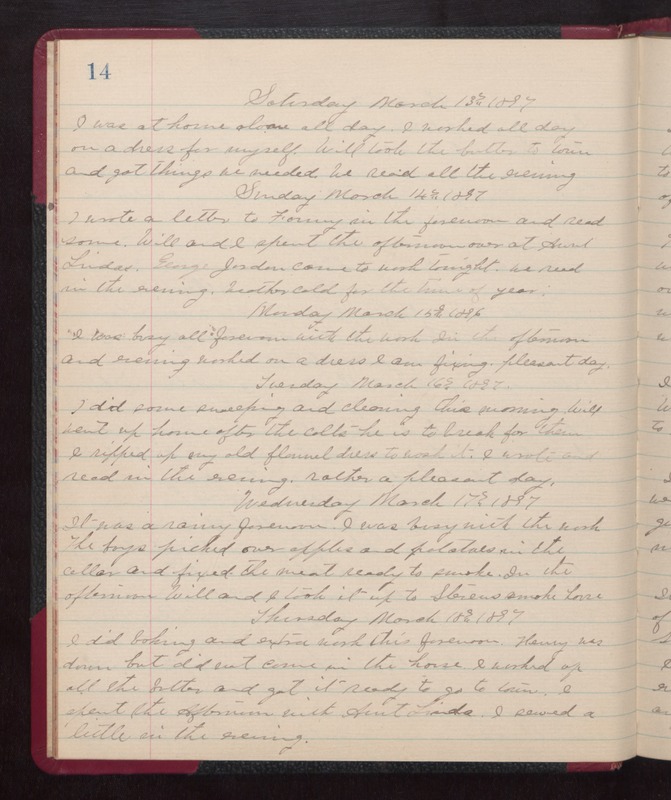 Tuesday March 16th 1897 I did some sweeping and cleaning this morning. Will went up home after the colts he is to break for them I ripped up my old flannel dress to wash it. I wrote and read in the evening. rather a pleasant day. Wednesday March 17th 1897 It was a rainy forenoon. I was busy with the wash The boys picked our apples and potatoes in the cellar and fixed the meat ready to smoke. In the afternoon Will and I took it up to Stevens smoke house Thursday March 18th 1897 I did [illegible] and extra [wash? work?] this forenoon. Henry was down but did not come in the house. I worked up all the butter and got it ready to go to town. I spent the Afternoon with Aunt Linda. I sewed a little in the evening.